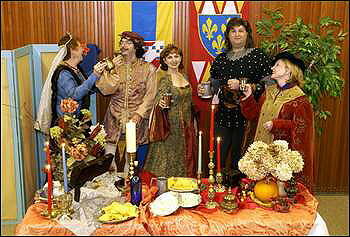 Feasts for the Alabama Renaissance Faire: Oct. 20th, 2001; Oct. 19th, 2002; Oct. 18th, 2003; Oct. 16th, 2004; Oct. 15th, 2005; Oct. 21, 2006; Oct. 20th, 2007; Oct. 18, 2008; Oct. 17, 2009; Oct. 16, 2010; Oct. 15, 2011. 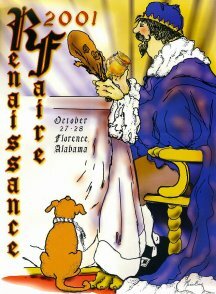 Hosted by the city of Florence, Alabama, as part of the festivities for the Alabama State Renaissance Faire, the official state fair of Alabama, held annually in October. James Matterer, Darell McCormick, Glenda Cockrum, Tammy Crawford, Lisa Holcomb-Blair, Marleyna Smith, Ray Walker, John Iaria, Chris Solis, & Lin Wilson. Assisted by Theresa Kanka. Special thanks to Ann Iaria & the Marriott Shoals. Here is our proposed menu for 2011, a feast of recipes from medieval Catalonia. This year was a "Feast of Turkish Delights," with an authentic traditional Turkish repast. This year, we were proud to be host an authentic German feast, in honor of Queen Rebecca Linam. Recipes inspired by Daz buoch von guoter spise, Germany, 14th c.
This year our feast on Oct. 18 was a repast of nautical & New World foods, in honor of our Pirate King, His Majesty King Gregory Bowling. 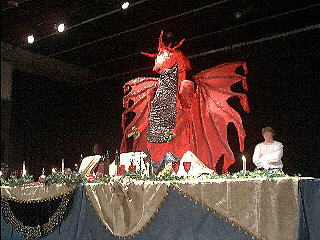 This year's Feast was held on October 20th. The theme for the menu was Italian, with a strong Middle Eastern influence, in honor of the reigning monarch, Queen Ostarra. Menu researched & composed by Lisa Holcomb-Blair of Mobile, AL. 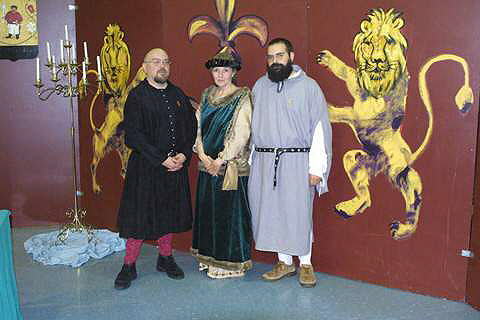 From the Florence Times Daily, Oct. 15, 2004: Royal delicacies: A Renaissance Feast, sponsored by the Alabama Renaissance Faire Roundtable, begins at 7 p.m. Saturday at the Florence-Lauderdale Coliseum. The meal -- prepared by chef Jim Matterer of Morgantown, W.Va., whose specialty is medieval/Renaissance foods -- will feature a plethora of period delicacies from his vast array of medieval recipes. 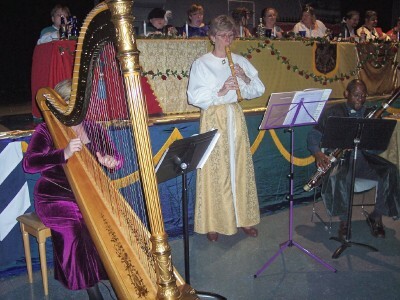 There will be entertainment from the Renaissance era performed by people dressed in costumes of the period. 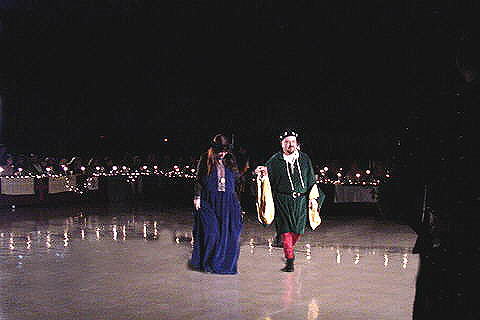 Those who attend the feast are urged to don attire befitting the Renaissance -- though it's not a requirement -- and bring their own goblets or drinking vessels. Groups of four or six might wish to bring their own table linen, pewter or wooden plates, candelabra, etc., and set their own table. Admission is $20 per person. Tickets are available at the Kennedy-Douglass Art Center of the Arts or Anderson's Bookland both in downtown Florence. For details, call 760-6379 or 768-3031. In honor of the Faire's king, Zolin the Wizard, this year's Feast had the theme of "Illusion Foods." It was a magical experience! "Everyone is in agreement that this year was our best ever; the general consensus is that the food was excellent, served hot and right on time. I particularly enjoyed the stewed beef. Great work!" - Lee Freeman, member of the Renaissance Faire Roundtable. The Gode Cookery crew, shortly after the end of the 2001 feast: tired but happy! From left to right: Jim, Glenda, & Darell. Jim & Glenda at the 2002 feast. 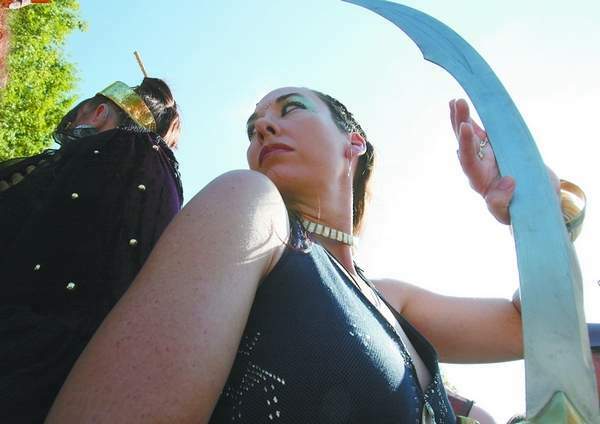 The Faire is held in downtown Florence at Wilson Park, on the corner of Tuscaloosa Street and Wood Avenue. Florence, Alabama, is located 120 miles south of Nashville, 145 miles east of Memphis, and 125 miles north of Birmingham. Begun in 1987, the official Alabama Renaissance Faire has developed into a major tourist event in northwest Alabama. For the past four years it has been named one of the top 20 events in the Southeast by the Southeast Tourist Society in Atlanta, giving it recognition by more than 800 media outlets throughout the region. 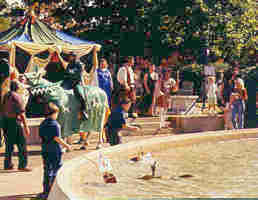 Held in Wilson Park (renamed Fountain-on-the-Green for the two days of the Faire), this unusual event draws 35,000 - 40,000 people each year to its site in downtown Florence, Alabama. It is always held on the fourth Saturday and Sunday in October, taking advantage of the balmy weather and the gorgeous fall foliage in the park. As the Faire has grown, so have the other events which surround it during Renaissance Month as October has been officially designated by the local government. Among the Medieval/Renaissance-related events held during October are musical programs, public lectures, dramatic performances, art exhibits and dance programs.  All of these are of the highest quality, and they set the stage perfectly for the Faire. Two free costume-making workshops are held on the first two Saturdays in October at the local Kennedy-Douglass Art Center. People of all ages are invited to bring fabric, and the rest (measuring, cutting, sewing) is done by men and women connected with the Faire. A person literally walks away with a simple costume in hand which he/she can embellish with jewelry, belts, etc. That a large percentage of people attend the Faire in costume is directly attributable to these workshops. Capitalizing on the fact that the Faire is scheduled during the school year, those in charge of planning have found creative ways to incorporate it into the schools. Art contests for young children, sonnetwriting contests for adolescents, and a poster-design contest for adults are outgrowths of the monthlong celebration. October is a great time to be in Florence, Alabama—especially the fourth weekend! 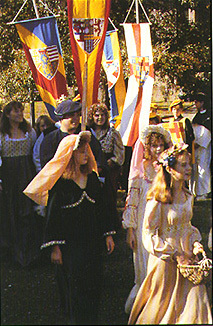 In October of 1987, the first Renaissance Month was observed in Florence, Alabama. Every fourth weekend in October a Renaissance Faire takes place as a two-day event. Florence is named for Florence, Italy, the founding city of the Renaissance movement in Europe during the 14th century. The Renaissance Faire covers the period of time from the 12th through the 16th centuries. 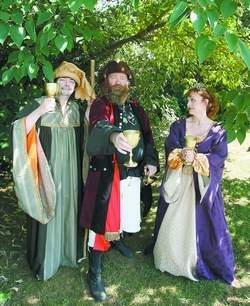 Authentic costumes, arts and crafts, and food are all a part of the Faire. Visitors can take part in medieval games and hear musicians playing authentic instruments. Artisans and merchants offer coins of the realm, hand-thrown pottery, jewelry, dried flower wreaths, and many other delights. Magicians, mirthmakers and minstrels wander about in period attire. 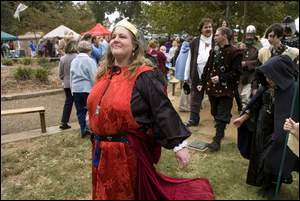 The Alabama Renaissance Faire is held in downtown Florence at Wilson Park - on the corner of Tuscaloosa Street and Wood Avenue. Florence, Alabama is located 120 miles south of Nashville; 145 miles east of Memphis; and 125 miles north of Birmingham.